The castle is situated at the beginning of the gorge of Strečno, on the left shore of the river of Váh (looking up the stream). It was built on a limestone rock 420 meters above sea level. It was the most safe fortress in the whole region of Horné Považie. Even though the history of the castle begun as late as in the half of the 14th century, the first settlements in the region were much older. Archaeological discoveries prove that the castle hill have already been populated in the Younger Stone Age. The first written mention of the castle originated in 1384. It was then named ‘comitatus castri Strechyn’. Several possessors of the castle have taken turns since the late 14th century. It was owned by Ján Korvín, Ján Zápoľský, Pavol Kiniži, the families of Pongrácovci, Kostkovci, Deršfiovci, Vešeléniovci and others. Later on, the castle was extended and rebuilt in the Renaissance style. The unsettled history of the castle had lasted until the end of the 17th century, when the emperor Leopold gave an order to tear it down. The results of the historical and architectural research led to a partial reconstruction and conservation of the castle. The main gate, main tower, southern palace, northern palace and the chapel were fully reconstructed. The northern tower and space in front of the gate were substantially renovated. A partial reconstruction was carried out in the eastern palace, castle walls and the fortification of the artillery. 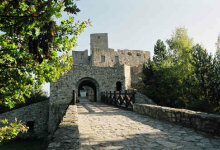 Rescue, reconstruction and conservation works took place in 1990s and the castle was opened up for public in 1995.